Self-publishing a book can be just as challenging as writing one. You have countless decisions to make about the book cover, back-cover blurb, book formats, metadata, and promotion. Choosing to self-publish your book means that you have to sink or swim as a one-person publishing house! 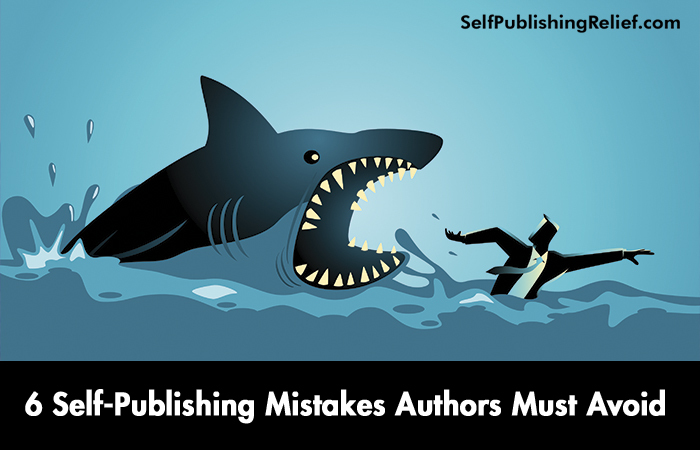 And if this is your first time (or even second or third time), it’s easy to make self-publishing mistakes. So before you take the plunge, we here at Self-Publishing Relief want to give you a heads-up about the errors most likely to hurt your efforts. Not Treating Your Book Cover Like A Marketing Tool. You may want to place your nephew’s stunning painting of a tangerine on the cover of your murder mystery, perhaps as a metaphor for the secrets to be unpeeled—but unless a bloody knife is stuck in that fruit, your story is unlikely to find your target audience. A book cover’s first job is to indicate genre and tone. Check out the covers of best-selling books similar to yours to ensure you’re giving your target audience the context clues it needs to correctly identify the content within. Attempting To Design Your Own Cover . Sorry, but a few hours tooling around with Photoshop or some other graphics-editing software does not make you a professional designer. Although you may be able to save yourself a few dollars trying to design your own book cover, it may cost you more in lost sales. Remember, your book cover is the most important marketing tool you have. In a side-by-side comparison with similar books, your cover should look just as good—or even better—than the competition. Trust a book cover designer with experience to give you the best possible bang for your buck. Having A Back-Cover Blurb Without A Hook. The purpose of this two- or three-paragraph blurb is to intrigue the reader into wondering, “What’s next?” Anything more detailed and you’ll be committing an author’s cardinal sin: boring the reader. Make sure to craft this critical piece of marketing material using active verbs, clear language, and every dramatic trick you know. Then take a tip from the pros and pass it to colleagues to test its worth and check for mistakes. Setting The Wrong Price. Having labored over your work for months (or years), you want the price to duly reflect your sweat and tears. But if you price your book too high—especially if you’re a new writer—no one is likely to buy it. Alternatively, pricing the book too low may get you lots of initial sales, but very little profit. And depending on the genre, some readers may see that low price and equate it with equally low quality. A good tip is to price your self-published book based on similar books. Also consider using Amazon’s Kindle Direct Publishing program’s eBook pricing tool, which estimates the optimal price of an eBook for maximum financial return. Choosing The Wrong Category. Whether you’re self-publishing an eBook or a print book through programs like CreateSpace, you are responsible for choosing the categories that best describe your project. Although it’s tempting to dump your Tangerine Murder into the “Fiction: Mystery” category—that would be a mistake. The Murder Mystery category is crowded with New York Times best sellers. As a new writer, your goal isn’t to drown in that sea but to rise to the surface by swimming in more shallow waters. Check to see if there’s a “Fruit Serial Killer” subcategory. Choosing this category will increase the visibility of your novel because it’s less competitive, so you’ll have a better chance to rise to the top of the front page of the search. Not Optimizing Your Keywords. Keywords help eBook vendors like Amazon decide where your book will show up in searches on their website. One of the most common self-publishing mistakes is dashing off whatever keywords come to mind when uploading your self-published book. Choosing the right keywords is a tricky decision that should be done with care. There are tools available for checking the popularity of different keyword strings, like the Google Adwords Keyword Tool. Or you can simply use trial and error, testing words with the Amazon search bar to see which bring up books like yours. Be sure to pick the keywords that will lead most directly to your book. The biggest advantage of self-publishing is flexibility, which means that any mistake you make can be quickly rectified. Fixing pricing, category, and keywords takes no more than a few keystrokes. Question: Considering your favorite genre, what elements on the covers indicate that this is a book you want to read? Hi SPR, that’s a great list you have there and thanks for including my article on kindle keywords. One thing I like to think about with keywords is that knowing what people type into Amazon and how many people type it helps authors to know how much interest there is for the book on Amazon. This is powerful if you do it before you write the book. Imagine doing your keyword research before writing and finding out that NO ONE is looking for your kind of book on Amazon. It doesn’t mean you can’t write the book, but it does mean you can’t depend on Amazon to sell it. Now you have to plan your book marketing strategy in a way that YOU bring the market to your book and not Amazon. Never ever skimp on cover design. That’s a pet peeve of mine. No matter how great the content might be- the cover is what will initially attract an audience!